Gnawa music is a rich repertoire of spiritual healing songs and rhythms. Its well preserved heritage combines ritual poetry with traditional music and dancing. Gnawa music is performed in a “Lila,” an entire night of celebration, dedicated to healing and trance guided by the Maalem and his group. InnoVe GNAWA Band Master, Maalem Hassan Ben Jaafer, who is a one of a kind master, inherited Gnawa Music from his father Sidi Abdullah Ben Jaafer Sultan Gnawa, and will be playing alongside the young generation master Samir LanGus who learned Gnawa music in the streets of Agadir, Morocco. 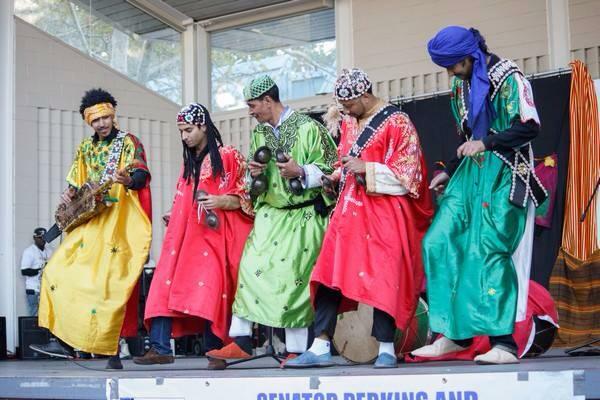 MOROCCAN NIGHT / GNAWA MUSIC at Terraza 7 on Friday February 6th , 2015 at 9:30 pm. No Replies to "MOROCCAN NIGHT / GNAWA MUSIC"